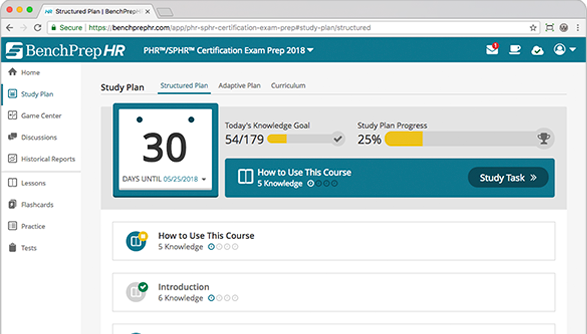 BenchPrepHR has updated our PHR and SPHR courses to match HRCI's exam content outline changes for the certification tests after August 1, 2018. If you purchase today you will get access to these updated courses. This course prepares for the Professional in Human Resources Certification. Advance your HR career by achieving the PHR certification. This course prepares for the Senior Professional in Human Resources Certification. The SPHR is designed for experienced HR leaders. This course prepares for the Associate Professional in Human Resources Certification, for the HR professional just beginning their HR career. 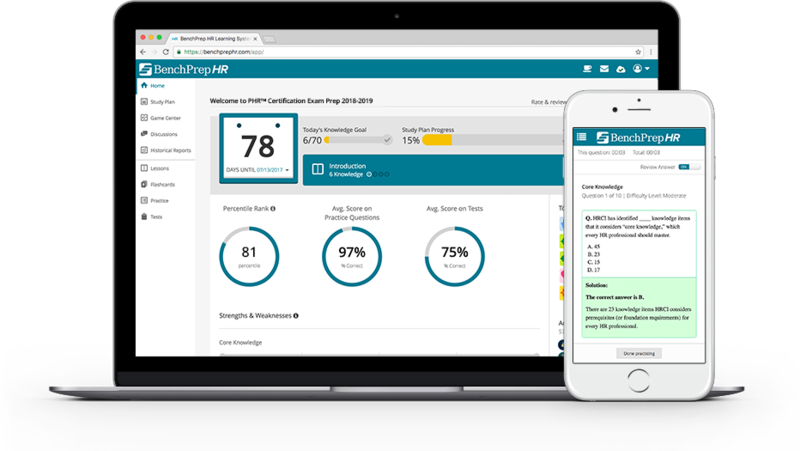 The BenchPrep HR Learning System makes use of best-in-class content and complex personalization algorithms to get you prepared in the fastest way possible. When you set your test date, you’ll receive a custom-tailored study plan with specific tasks to help you stay on track. By presenting and training key concepts at a fine-tuned pace, our learning system makes it easy for you to achieve your goal. Every minute of practice counts when your goal is to pass the exam on the first try. BenchPrep is the world’s only PHR/SPHR/aPHR prep program that works seamlessly on web, mobile and tablet devices—giving you anytime, anywhere access. Web & mobile apps remain in perfect sync, allowing you to start where you left off and seamlessly switch between devices. In addition to the self-paced learning system, every candidate gets access to recordings of past webinars led by BenchPrep’s team of seasoned HR experts. Led by SPHR-certified instructors with years of experience teaching HR prep courses and university-level courses, these webinars provide comprehensive review to help candidates get ready for the exam. Functional area review sessions cover the key learning objectives within each functional area and walk through challenging example questions. Content review sessions cover hot topics for HR professionals. John Newton, SPHR, is a Human Resources and Learning & Development professional who has been teaching certification prep courses in person and online for over 10 years. He is also a Human Resources and Business Management Instructor at DePaul University and Northern Illinois University. John is a consultant with John Newton and Associates, working with industries such as Software, Financial Services, Transportation, Manufacturing, City Government, Advertising, Healthcare. Barbara Mitchell, SPHR, is Managing Partner of The Mitchell Group, an HR consultancy. She has held senior HR leadership positions with Marriott International and Human Genome Sciences, and in 1998 co-founded The Millennium Group International LLC, an HR consultancy sold in 2008. She is a co-author of two books with Cornelia Gamlem, The Big Book of HR and The Essential Workplace Conflict Handbook, as well as the weekly blog Making People Matter. She is also a co-author of The Essential HR Handbook: A Quick and Handy Resource for Any Manager or HR Professional. Cornelia Gamlem, SPHR, is Founder and President of the GEMS Group, Ltd., a management consulting practice. She is a co-author of two books with Barbara Mitchell, The Big Book of HR and the Essential Workplace Conflict Handbook, as well as the weekly blog Making People Matter. She is also a co-author of Roadmap to Success: 5 Steps to Putting Action into your Affirmative Action Program. Cornelia has been quoted in The Wall Street Journal, The New York Times, The Financial Times, The Boston Globe, and Fortune. She earned her undergraduate degree in Business Administration from California State University, Sacramento and her Master's Degree in Human Resource Management from Marymount University. Barbara Flynn, SPHR, MS, SHRM-SCP, is the President of People First, Inc., a payroll and HR company she founded in 2000. Barbara is also a University HR instructor with over ten years of experience teaching HR Certification courses and over five years teaching general HR courses. She is a past President of the Human Resource Association of Broward County. Barbara received her Bachelor’s Degree in Language & Linguistics from Florida Atlantic University and received her Master’s Degree in Human Resource Management from Nova Southeastern University. Larry A. Hobbs, M.B.A., SPHR, SHRM-SCP, is a Human Resources Consultant and Trainer with Management Resolve. With over 30 years of HR experience, his extensive background includes positions as a Personnel Management Specialist with the federal government and a Human Resource Manager for the General Dynamics Corporation. Larry has been an Adjunct Instructor at the University level for 22 years, and is the author of over 50 published articles on HR topics. Larry has served on Board of Directors of the San Antonio Human Resource Management Association (SAHRMA). Larry has a B.S. from Abilene Christian University and an M.B.A. in Organizational Behavior & Management from the University of Alaska. BenchPrep’s comprehensive learning platform has helped more than 3 million learners attain academic and professional success. The world’s leading education, training, and assessment organizations, including ACT, Becker Professional Education, AAMC, CFA Institute, McGraw Hill Education, GMAC, and OnCourse Learning, leverage BenchPrep to improve learning outcomes. 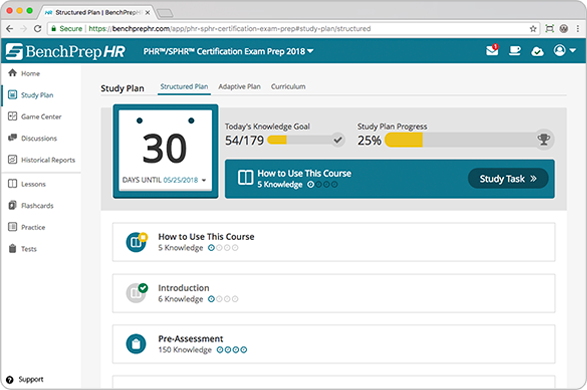 The BenchPrep HR Learning System leverages the data from these 3 million+ learners to offer you a game-changing PHR/SPHR/aPHR learning program. © 2019 BenchPrep. All Rights Reserved.